Gettysburg Flag Works offers an effective solution to illuminating your American flag and in ground flagpole with a wide assortment of flag pole lights. Our brand of flag pole lights – the Revere Solar Light – is the best & most reliable solar flagpole light on the market. This flag pole light has no wires to install, and comes in three different color options (white, silver and black). It illuminates your flagpole with four bright white LED lights. These flag pole lights turn on automatically at dusk, but also come with a manual on/off button. The three rechargeable batteries support up to ten hours of illumination. This flagpole light fits flagpoles that are 1.75 inches to 3.5 inches in diameter, or can be mounted on a flat surface. The Revere Solar Light comes with stainless steel mounting straps and a bracket. The flag pole light can be used up to 25 feet from the flag. If you are looking for an environmentally friendly solar flagpole light, Gettysburg Flag Works has what you are looking for! The green solution is a flagpole light that has no wiring or electric involved. This flagpole light is safe and easy to install. The flagpole light operates with self-charging solar batteries (that are included), and there are no special tools required to set up. The solar panels of the flag pole light collect sun all day, and then will automatically illuminate your flag and flagpole at night. Ideally, this solar flagpole lighting system should be placed in an area that will capture the maximum amount of sunlight. 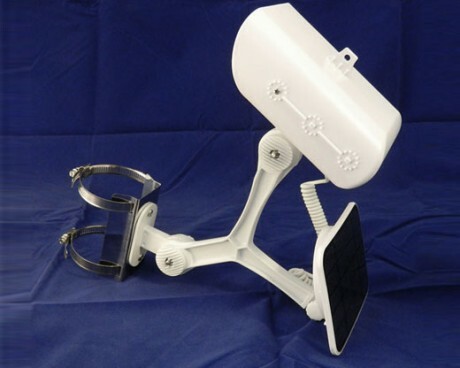 You can use this solar flagpole light for use with in-ground flagpoles that are 15-25 feet tall. The final option that we offer for solar flagpole lighting, is a flag pole light that fits on the top of your house-mounted flagpole. This flagpole light is used for 5 foot, 6 foot, 8 foot and 9 foot house mounted poles. The solar flagpole light is 5.5 inches in outside diameter, and weighs only 5 ounces. It includes a collection of three adaptors, and each features an angle adjustable connection. These flag pole lights are environmentally friendly and are easy to install. 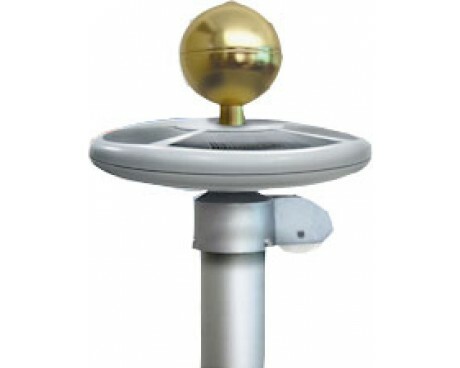 Flagpole finials are nice addition to your flagpole and will stand out, once illuminated by your solar flagpole light. We have a wide assortment of flagpole finials that include aluminum balls, gold leaf copper, and eagle ornaments. Each flagpole finial comes in a variety of sizes, and are easily screwed into the top of your flagpole. Protect your American flag with additional flagpole hardware including one of our anti-theft items. Cleat cover boxes are designed for easy installation as the cleat holes are used for mounting. These flag pole parts come with a choice of padlock or cylinder lock. They fit up to a 9 inch long cleat.